One of the maps illustrating Swift's iconic satirical work, Gulliver's Travels. "Each of Swift's countries is depicted on a map; one of the interesting features of the Travels is that it is produced in a fashion identical to that of a contemporary travel account, so an uninformed reader might take it for a work of fact, not fiction." Baynton-Williams 2015, 72. 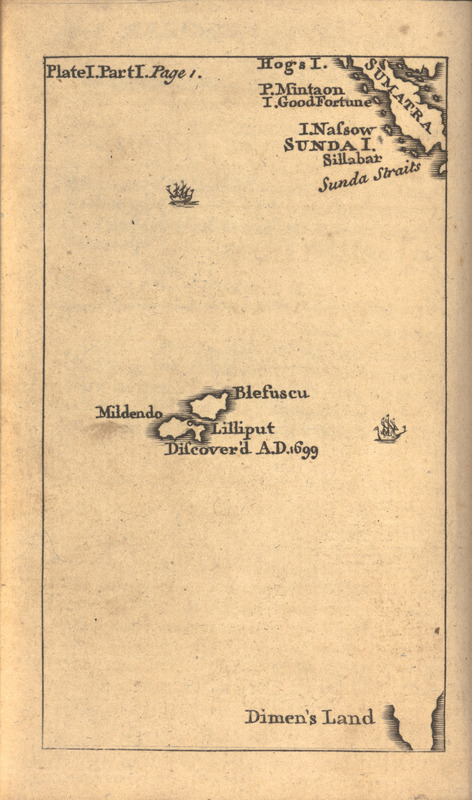 As such, the maps contribute to Swift's end: "Just as Swift uses the contradictions between Gulliver's claim of truth and his actual deceptions to to undeceive us about the stability of human knowledge and capacity, so the maps in the Travels use our assumptions about the verisimilitude of maps and the actual contradictions within the maps themselves to . . . point out that all stability and knowledge are problematic." Didicher 1997, 194. See Padron 2007, 270-71. Virtually all the 18th century editions contained these maps, ibid.184, and "considering the number of editions of Gulliver, they must certainly be among the most widely circulated maps in our literature." Bracher 1944, 61. Apart from the mythical portions, it appears that the maps were copied from Herman Moll's 1719 New & Correct Map of the Whole World: "The correspondence of coast lines, place names, and spelling is unmistakable." Ibid. 62. It's clear that Moll himself did not make the Gulliver maps, and among the candidates it seems most likely that they were drawn by John Stuart and engraved by Robert Sheppard, the authors of the portrait of Gulliver in Swift's frontispiece. Ibid. 70-73. Although Swift's role in the preparation and inclusion of the maps is unclear, there is evidence that he approved - or at least did not disapprove - of their use. Ibid. 64, 73-74. For the satirical world map from Joseph Hall's Mundus Alter et Idem [Another World, and Yet the Same] (1607), see ID #1009.01. Swift, Jonathan. 1751. Capt. Lemuel Gulliver's Travels into several remote Nations of the World, in The Works of Dr. Jonathan Swift. v. II. London: C. Bathurst.